Introduced in 1996, this cultivar is the product of a University of Minnesota cross of a French-American hybrid and the North American native grapevine Vitis riparia. Frontenac has good cold-hardiness to around -30°F. This cultivar also shows good vigor, a productive nature, and is generally resistant to many of the common fungal diseases. Grapes are harvested mid-to-late season; they are often allowed to hang on the vine for a period of time to develop their full flavors. 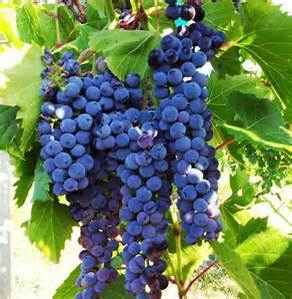 Ripe Frontenac grapes have high sugar levels and acidity. They can produce excellent red wines that are often deeply colored, have a distinctive cherry aroma, and pleasing plum and berry flavors. Click here to view the commercial we produced for the Frontenac grape.